Declining a feast of freshly plucked guinea pig in Simiatug, it was time to move on again. 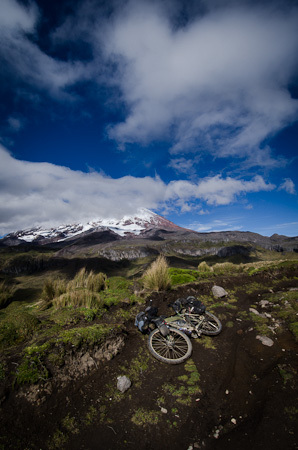 My original plan involved following a dirt road that zig-zagged up and over a pass towards Volcan Chimborazo, and eventually to Riobamba. 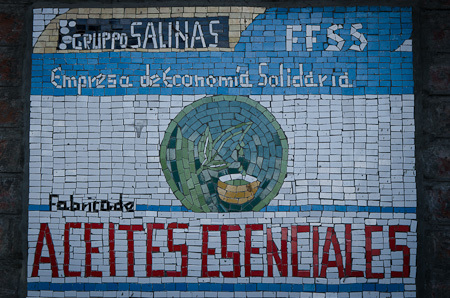 But I decided to visit Salinas first, famed as it is for its impressive collection of co-ops, including a cheesemaker and – of particular interest – a renowned chocolatier. The route there seemed especially enticing. After my usual exhaustive investigations (trying to patch linear holes in my woefully fictitious map, and make sense of vague, Latin American hand gestures), it transpired that aside from the ‘main’ dirt road to Salinas, there was a smaller option, passable only by motorbike, bike and horse. 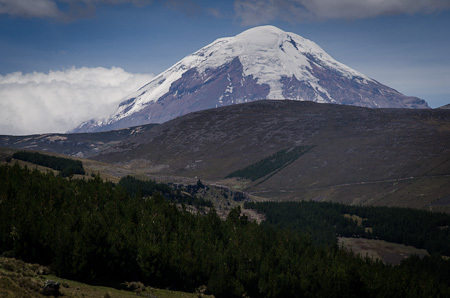 What’s more, this route would also allow me link up with the road I originally intended to take to Chimborazo, without backtracking all the way to lower-lying Simiatug (which I ended up doing anyway, as there was a market on in town – and I like my markets). 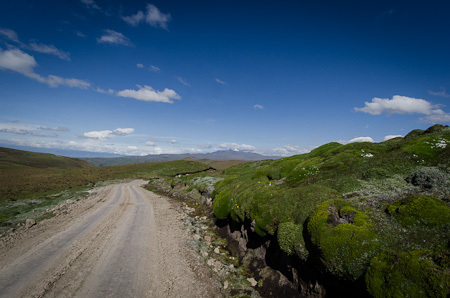 Eventually it lead me to the main road at Rayobamba – also dirt, I was pleased to see. 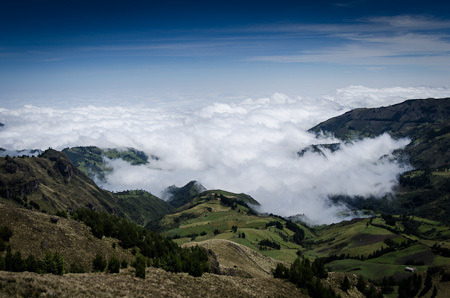 At this point I was at 4000m, way above the clouds, which crept forward like a rising sea tide. 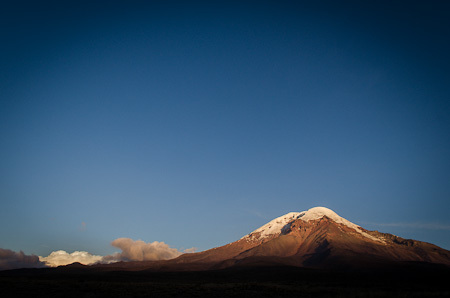 There followed a sharp, 6km descent to Salinas – dropping over 500m in one gulp – offering some impressive views of Chimborazo. Thanks to the bulge in the earth at the equator, its peak is the closest point to the sun on the planet. … and an essential oils factory. 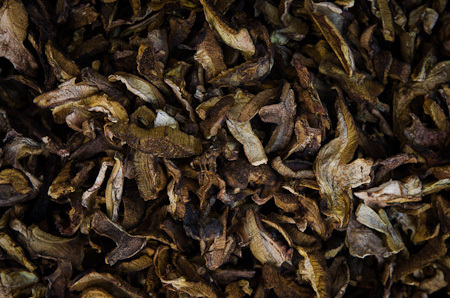 Other produce includes dried mushrooms, perfect for travelling and adding to a soup, or frying up with oil and garlic. Now I’m not longer running a Rohloff hub (sorely missed), I’m taking better care of my drivetrain. After so many grubby kilometres, I figured it was time to swap my chain with the spare I was carrying, and help extend the life of my cassette. Then it up over the hill again and back to Simiatug. I’d planned to loop round the valley without the need to drop down into town once more, but I’d heard talk of a fiesta, so I headed back to check it out. Food and livestock were on sale, and throngs of people milled in the streets. 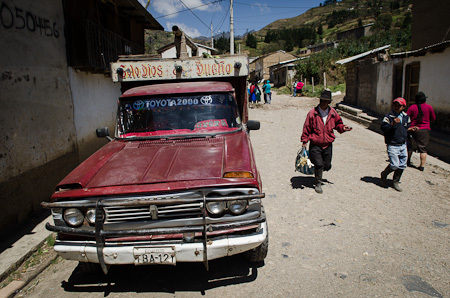 Various beaten up pickups had made the journey from outlying villages. This is where you come to park your horse. Small world. 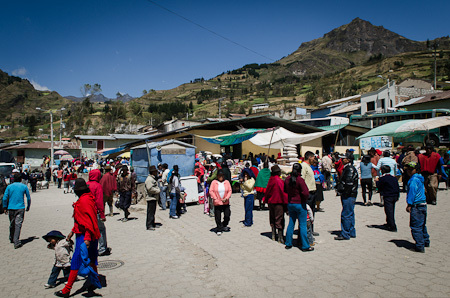 A couple of market goers, who’d seen me riding here from Zumbahua, came over to me to shake my hand. And I bumped into a few others I’d chatted to along the way, like they were old friends. From there, it was back up again, along this quiet dirt road. 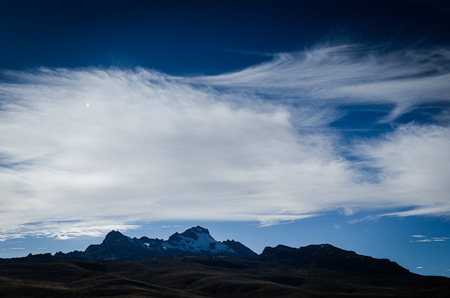 It eventually plateaued at 4250m, after a 1000m climb over 14kms. 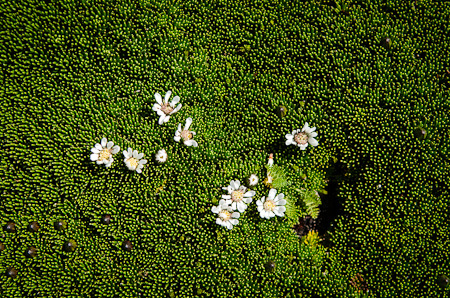 To either side of the road were strange, bulbous, moss-like formations, home to clusters of high altitude daisies. 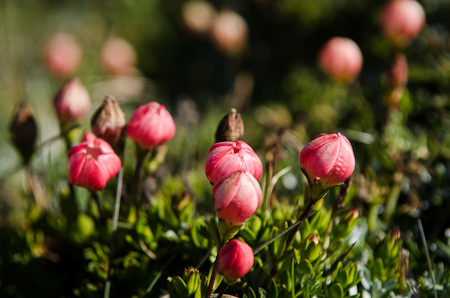 As well as other tiny, intricate flowers. I have to admit that the 10km cobblestone descent on the other side of the pass was a ball-buster. Occasionally, there was a strip of dirt to one side where I could seek refuge. Still, even if the night was a long one, the campspot – protected from the howling wind – was good. Plenty more of that to come. 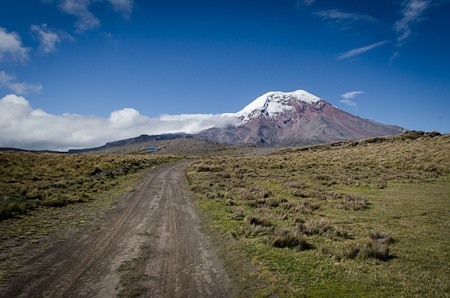 Although I was feeling incredibly weak, I limped my way onwards to the dirt road that runs between Volcan Chimborazo and Volcan Carihuairazo. 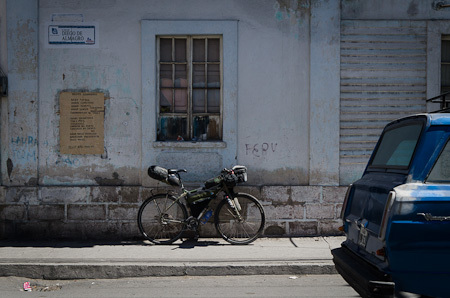 As luck would have it, there was a small refugio nearby, where I decided to rest up for the day. 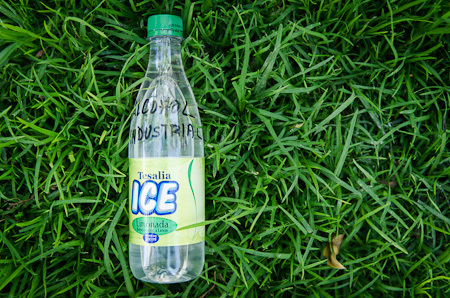 The local community was doing its best to develop an eco-tourism project. 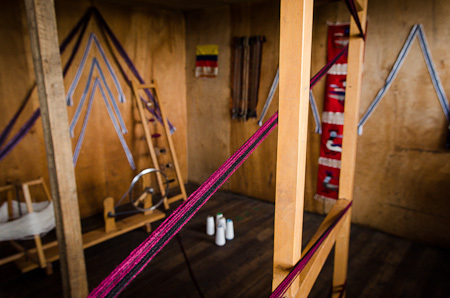 One of the buildings was set up for weaving. They also drew me a nice little map to supplement the topo I had, and help me on my way to Riobamba. 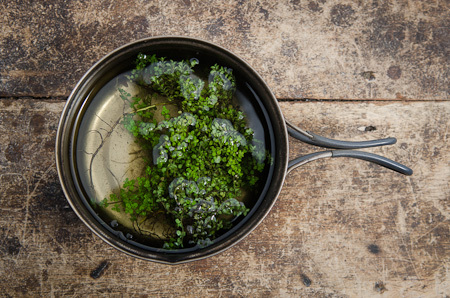 And, to help my still poorly stomach, a plant was collected from the páramo and boiled up into a tea – sompo seemed to be the name. It’s supposed to help with altitude too. The next day I was feeling stronger, so headed onwards. 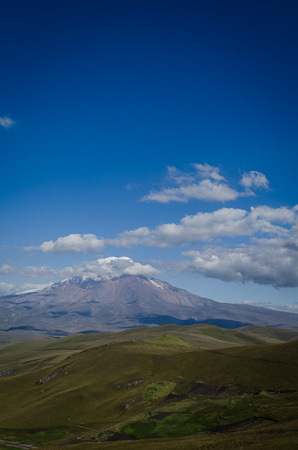 There’s Chimborazo to my right. And Volcan Carihuairazo to my left. 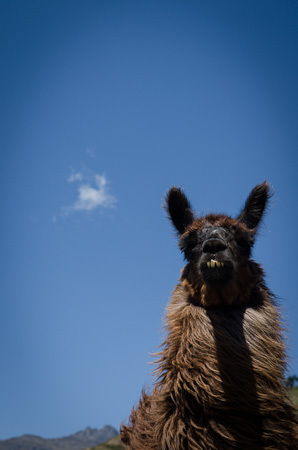 Vicuña, the athletic siblings of the fluffier llamas. This was a dreamy trail for the most part. The sun flitted in and out, until usurped by clouds. 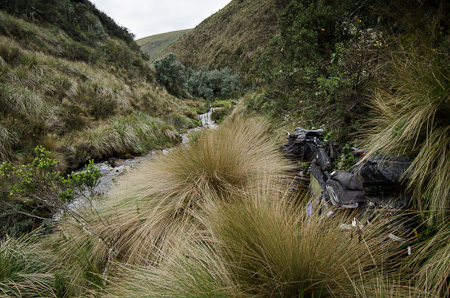 My orders were to cross the Mocha river to link up with the road to Urbina – but where, I wasn’t quite sure. It took me an hour of traipsing through thick, uneven grasses and dodging ditches – crossing the same river a half-dozen times – before I tracked it down. Unfortunately, it was also at this point that I noticed, to my dismay, that my pedal had disappeared during one of the river crossings. I’d have to make do, and ride the spindle, local style. At least the road from there was all but downhill…. 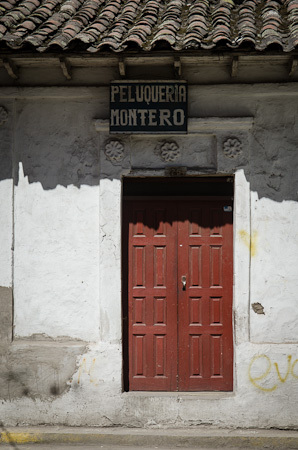 … a ramshackle, chaotic, colourful and friendly town that I immediately warmed to. 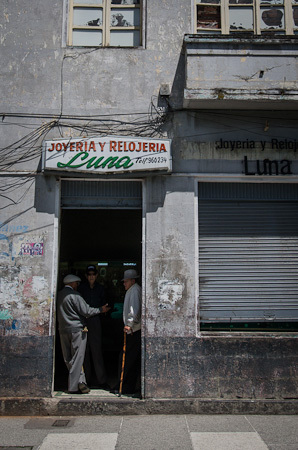 Plenty of elderly architecture has survived the ravages of volcanic activity, crammed with all manner of commerce: hair dressers, bakeries, hat shops, fruit shops, bike shops… In fact, there was the gentlest of tremors on one of the days I was in Riobamba. Even the newer concrete blocks have some quirky character to them. 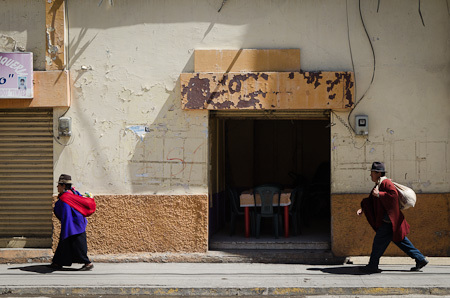 A mix of mestizo and indigenous walked the streets, throwing in an extra dash of colour. 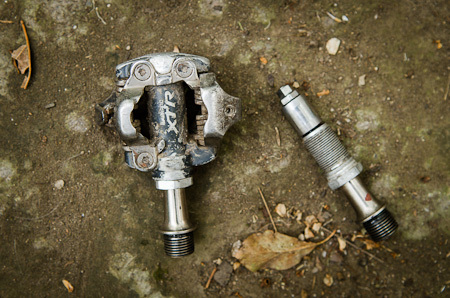 I chanced upon Patricio’s little cave of bike parts, where I was able to source some new Shimano M505 pedals for $35. Incidentally, some 29er tyres were due in soon. 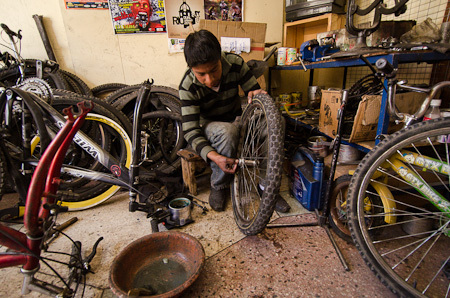 Patricio went on to completely overhaul my rear Deore hub, meticulously stripping it down, scrubbing it clean and fitting new bearings. ‘Estoy quitando un poco de peso,’ he said with a laugh, referring the all the mud and muck he found inside. I’m saving you some weight! My freshly-oiled freehub spinning freely once again. The charge? One whole dollar! He wouldn’t take a cent more, and insisted it was to help me on my way. Patricio’s young apprentice at work. I’m sure he’ll turn out as adept as his boss. 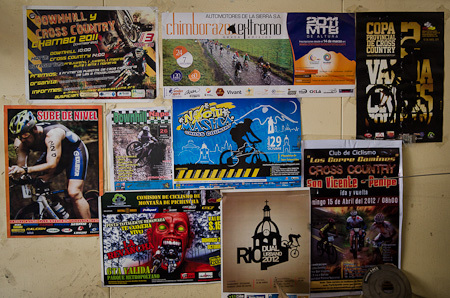 Judging by the posters on the wall, the area seems to have a thriving mountain bike scene. 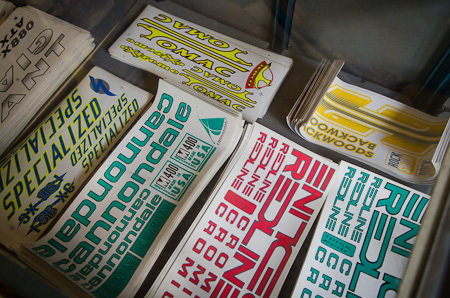 Another bike shop round the corner had these an assortment of stickers, to transform bog standard frames into the likes of fancy Specializeds, Cannondales, even Tomacs, Redlines and Oranges! I also managed to track down some fuel for my Trangia – ‘alcohol industrial’ is the name used for methylalated spirits in Ecuador. When the owner of the hardware store found out I was from the UK, he announced – in pigeon English – that it was Paul McCartney’s birthday that very day. Which it was. 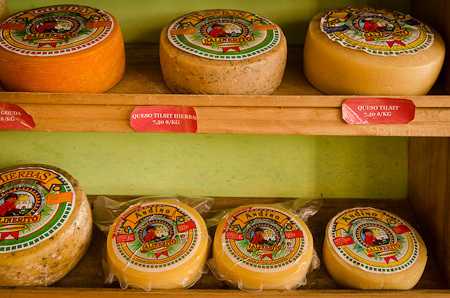 Ecuador is incredibly cheap to eat. 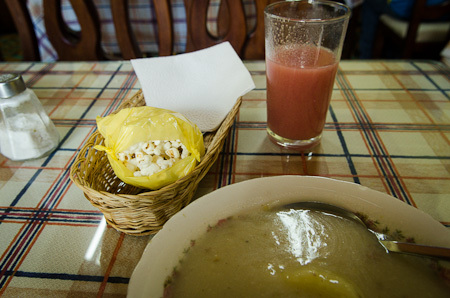 A three course almuerzo – soup, main, juice and sometimes even a desert or piece of fruit – is often as little as a $1.75. 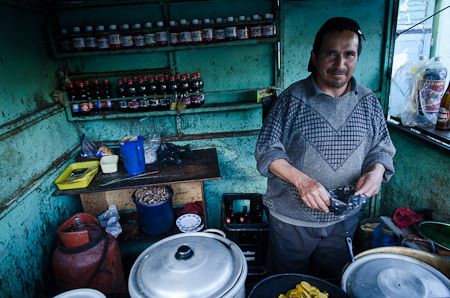 Get used to soggy popcorn though: Ecuadorians lob them in their soups. Ogre, riding great again thanks to Patricio. There’s various dirt road options around here, depending on how you want to do it. 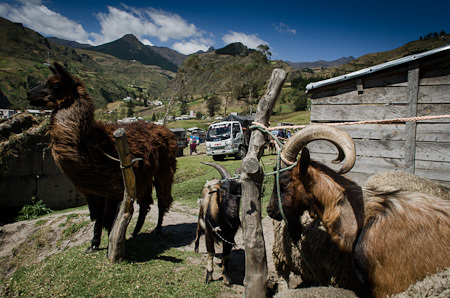 To take the back way from Simiatug (3200m) to Salinas (3550m), ask for the road to Cocha Dorada. 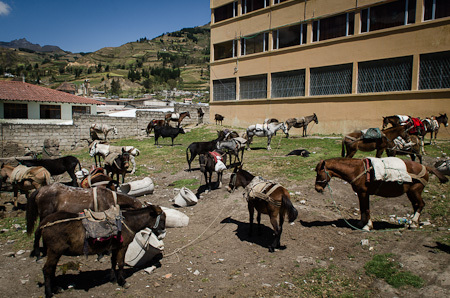 At the school, the road continues to the left towards Tingu, linking up eventually with the Ambato-Guaranda highway, and onto Chimborazo. Or you can turn right, as I did, heading for the main dirt road at Rayobamba. Once you hit the road, take a left, complete the rest the climb to 4000m+, then drop down into Salinas for the last 5-6km. Via the back way, it’s about 22kms from Simiatug to Salinas. 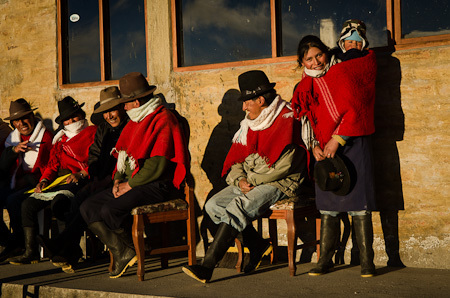 To go directly from Simiatug to the main Ambato-Guaranda highway, ask for the road to El Salado – it’s dirt, and the one the buses take. Follow this up and over the pass (14km up on dirt, 10km down on cobbles, max height 4250m). 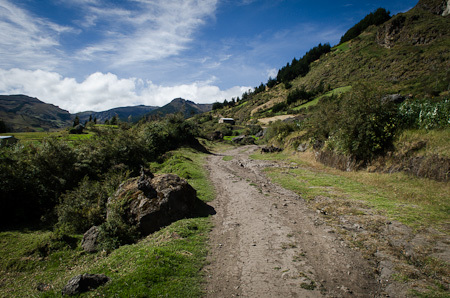 Before the pass, the dirt road is joined by another to the right – that’s the route via Cocha Dorada, an alternative road that loops round the opposite side of the valley, and the way you’d come if you were riding from Salinas and wanted to avoid dropping down into Simiatug. 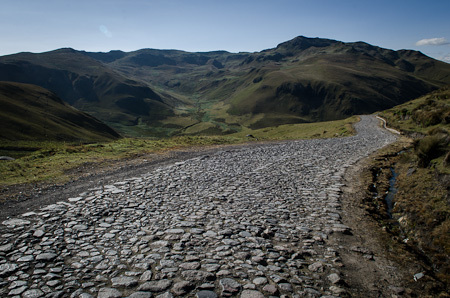 The cobbled descent emerges at Max’s international Bar – hang a right on paved for 11km. 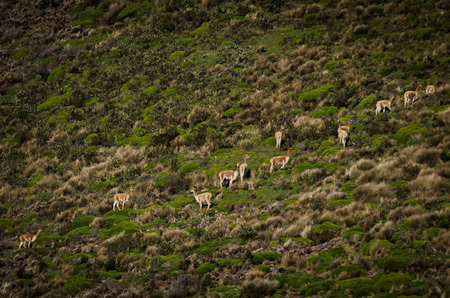 This will take you to the main Ambato-Guaranda highway. 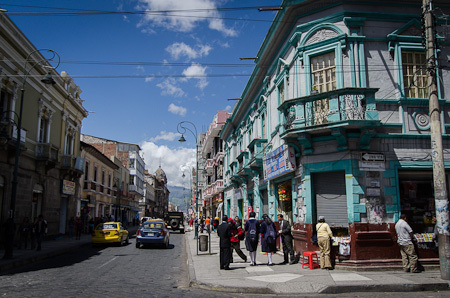 Take a left, towards Ambato for a few kilometres. 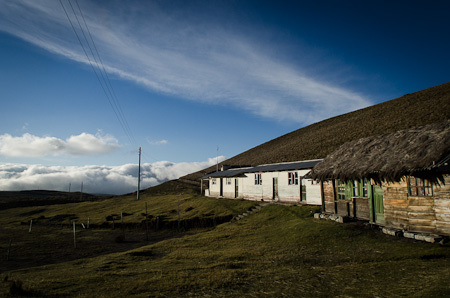 The dirt road that cuts between the two volcanoes is at the second school – there’s a sign that reads Escuela Manuela Canizates. Ask anyone for the road to Mocha or Urbina. From there, it’s 5km to the cabanas where I rested up. They are signed, and cost $7 a night, with bathroom, electricity and kitchen. 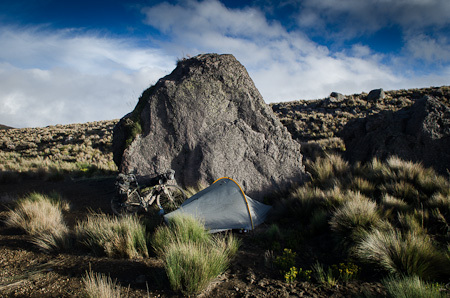 You can camp there too, but probably best to continue a few more kilometres to the lake, where there’s some great spots right below the volcano. 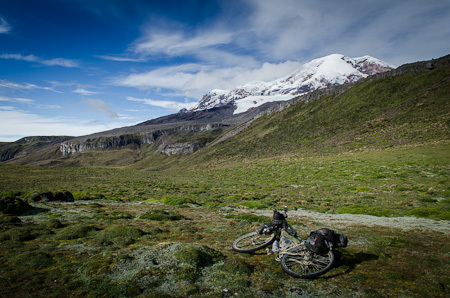 Broadly speaking, aim from here to link the track between the volcanoes with the one to Urbina which runs on the other side of the river you’ll see as you descend – rather than heading straight on to Mocha, which will spit you out further north on the Panamerican. Apparently the road to Mocha is in far worse condition too. 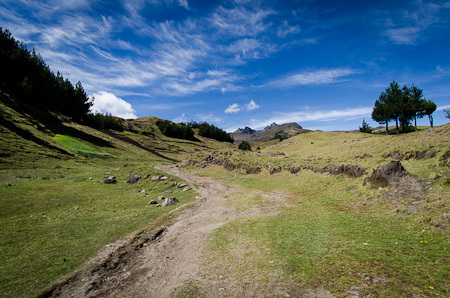 So, follow the main track passed the cabanas, which is in good shape, until it degrades into a series of boggy paths after its highest point, 4250m, descending steeply – some pushing and shoving required. You’ll hit a bridge and a shepard’s hut. I cut across the valley here, having seen the dirt road to Urbina on the other side of the river in the distance. 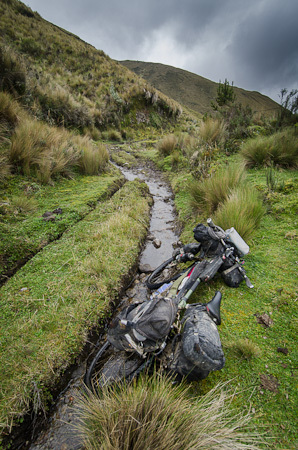 But it involved some awkward bog and river crossings, which would be very tough on a fully laden bike. The dirt road to Urbina is in great shape. Follow it a few kilometres to the second (cobbled) junction, ignoring the first, signposted Portal Andino. 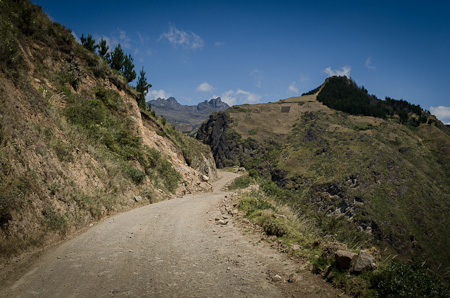 Taking a right should lead you to Quatro Esquinas, just above Riobamba – which I’d have done if my pedal hadn’t exploded. This road is cobbled. Or, follow the signs to Urbina to the left. Shortly after this junction, as the road is about to climb, there’s an unsigned dirt road to the right, leading to Andaluza. 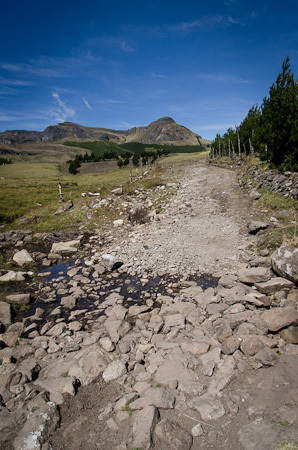 This cuts off a few paved kilometres, the rest being on the Panamerican (downhill, 15-20km). If you miss it and get to Urbina, it’s no big deal. All in all, it’s about 30kms of dirt from the Ambato-Guaranda road to the Panamerican. Only the middle linking section is a challenge on a fully laden bike. 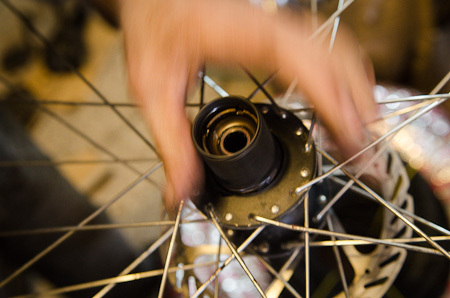 Deore hubs are a little awkward to service, yet Patricio stripped and serviced my muck-packed hub like he’d one it a thousand times. 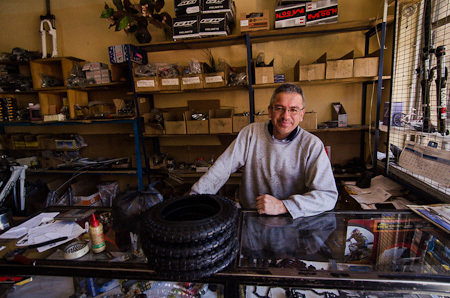 A great mechanic, and a really nice guy. His address: Patricio Cabezas, Juan Montavo, 19-24 y Villanoel – it’s a few blocks down from Veloz, and parallel to Corabobo. 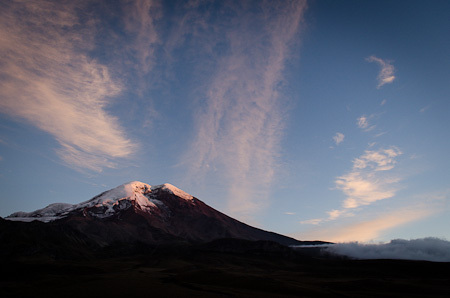 This entry was posted in Ecuador and tagged Chimborazo, Riobamba, Salinas, Simiatug, Surly Ogre on June 17, 2012 by Cass Gilbert. So what did end up becoming of your beloved Rohloff? I was shocked to see it didn’t get transferred over to the Ogre. The Rohloff is still built up with a Rigida Andra 30 CSS rim (26in). I wanted to get it rebuilt up by Neil at CycleMonkey as he has so much experience, and understands the ins and outs of a Rohloff build. 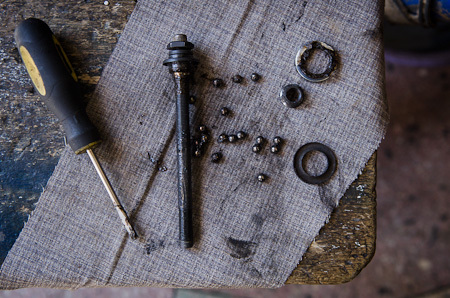 But I was disorganised in picking a replacement rim, and getting it sent off to him – and a little loathe to pull apart such a hardwearing wheel. 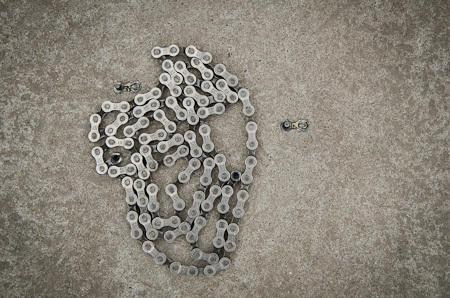 Still, it’s been a while since I put some serious mileage with a derailleured bike, so it’s a good reminder of the pros and cons of each system. Overall, for all its quirks, I feel the Rohloff really is the way to go for this kind of riding. I just stumbled onto your page yesterday as I was looking into travel photography for myself… what an absolute pearl of a find. I am so very much enjoying seeing your incredible travels.. travels that most of us can only dream of! Ah, what a fine story. Makes me remember my year spent in Honduras & CA, just that I didn’t have a bike nor a digital camera with me, back then in 2000. And Platanos are just delicious when fried – eat some for me, will ya?! Looks like another great route. Hopefully you’ll publish a guidebook someday.. 🙂 I’m curious about how the pedal “exploded”, the thread on the spindle seems to be ok, did the aluminum body break into pieces? I’m using the same peddles and love them. Just one word Cass ………. CTC York Rally this weekend, it’s going to be wet ! Check out http://thatemilychappell.com/ from Wales to China. hey you – looks like awesome riding!! check your email doofy – i’m breaking out of this place! Hi Cass, just back from the CTC York Rally. Wind & rain meant that not much riding was done, but I was interested to see a good looking framepack on the Alpkit stand, the girl I spoke too said they’d be individually made for approx £100. 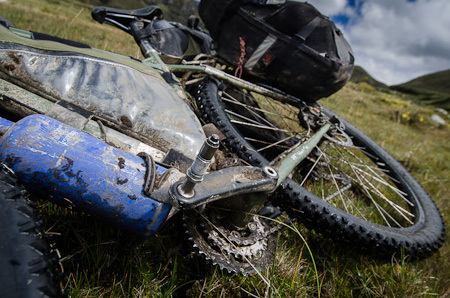 On an interesting gear note, one of this year’s Tour Divide leaders was just foiled by the exact same pedal malfunction. Same pedals, same problem, same week. Odd. Hope you are really well, my friend! hey cass, what maps do you use? I’m super impressed looking at these old routes you’ve found. I’ve been using open cycle maps but they’re not great! At the time I didn’t have a GPS so just relied on a bad ITMB paper map and persistent questioning. More recently, I’ve been supplementing my interrogations with the Gaia App on my iPhone, and the Cycling Topo Thunder Forest overlay. It’s also OSM, but seems pretty good. 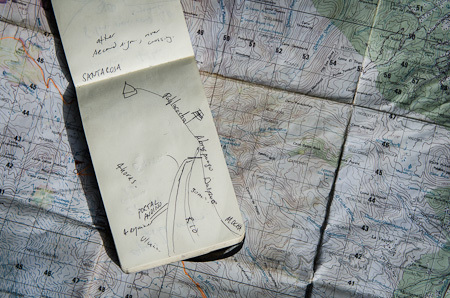 Garmin’s Ecuador Topo – which I’ve been borrowing – has the most detail. Btw, where are you guys now? I was in Tumbaco yesterday, and Santiago said I’d missed you by a couple of days.